Following on from Simon’s blog on the cost of moving your firm to the cloud, I am going to cover how recent changes in the telecommunications landscape have impacted the pricing model, while at the same time reducing cloud service downtime. “Cloud” generally means that something is housed in a data centre somewhere and your business accesses that resource via the internet. A private Cloud means that a key piece of equipment is housed in a single office and other offices access that hardware via the internet. In either case, the key factor in the success of this model is highly available access to the internet. Any one of these going down would severely impact a business’s productivity. The good news is that it has become comparatively low cost for customers and IT providers to utilise a self-recovering solution where you have two different connection types, which are configured to switch to the other if one goes down. Beyond the service itself though, UFB has had a big impact on adjusting the markets perception of a reasonable price for unlimited internet connectivity. Since 2012 business internet connection pricing has plummeted while at the same time almost universally increasing in speed and improving in design (fibre instead of copper). This leaves businesses in a position where the cost of dual services terminating on separate routers, which is best practice – or a single router, which is more cost effective – and configured to switch to the other connection within two seconds of the primary connection failing, can cost as little as $400 – $500 p/month (dependent on access types available at your location). This design option ensures uptime of 99.99% and ensures that a move to the cloud doesn’t introduce an unacceptable risk to a business. Internet connectivity in New Zealand has rapidly improved in design while simultaneously decreasing in price. If you are looking to move to the cloud, re-assessing your access to the internet should be a key part of the evaluation process. 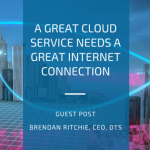 Brendan Ritchie is the CEO of DTS, a provider of business internet, WAN, IP voice, hosting, managed services, co-location and and data services in Australia and New Zealand. Resolve is the best IT team in town. We love our customers and want to see them succeed. We want you to forget that you have IT – it just works. © 2019 Resolve All Rights Reserved.